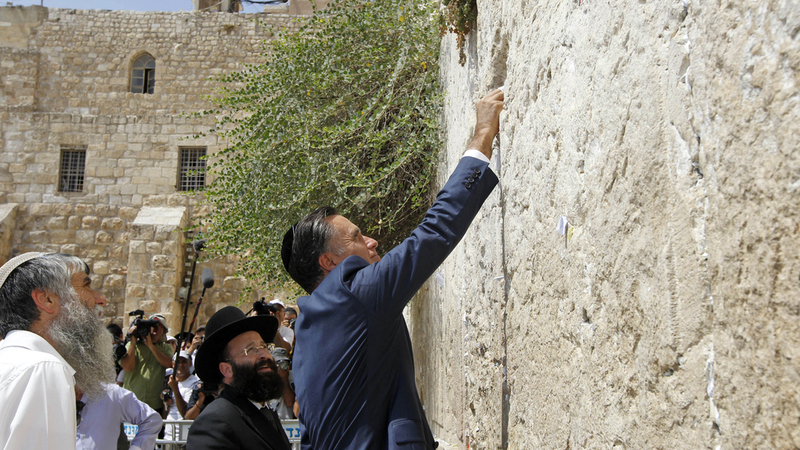 Republican presidential candidate Mitt Romney places a prayer note during a visit to the Western Wall in Jerusalem in July. Israel is one of the few foreign countries where residents have a clear preference for Romney over President Obama. Israelis view the American presidential election much the way they tend to view most issues: What does it mean for Israel? And by a wide margin, Israelis seem to believe that Republican candidate Mitt Romney would be more attentive to Israel's interests than President Obama. The Peace Index Poll, commissioned by Tel Aviv University and the Israel Democracy Institute, found that Romney was favored 2-to-1 by Israelis back in August. Such pro-Romney sentiment is rare outside the U.S. A recent BBC poll of 21 countries found Obama favored in 20, with Romney taking only Pakistan. Israel was not included in that survey, though, and Israelis are long used to being a prominent â" if not the dominant â" foreign policy topic in U.S. presidential campaigns. In Monday's foreign policy debate between Obama and Romney, Israel was mentioned more than 30 times â" far more than Europe, Afghanistan or the Arab Spring, let alone Africa or Latin America. The only country mentioned more often than Israel was the one the Israeli government keeps trying to draw the world's attention to â" Iran. Obama has what is widely seen as a cool relationship with Israeli Prime Minister Benjamin Netanyahu, and many Israelis have never warmed to the American president. Romney has repeatedly accused Obama of not being supportive enough of Israel, accusing the president of having "thrown allies like Israel under the bus." The Obama administration has denied this, saying the security relationship between the countries has never been stronger. Israeli conservatives have long advocated closer ties with the GOP. But former Mossad spy chief Ephraim Halevy, this past week in The New York Times, noted that "whenever the United States has put serious, sustained pressure on Israel's leaders â" from the 1950s on â" it has come from Republican presidents, not Democratic ones." Nevertheless, the verdict seems clear: If the race were up to Israelis to decide, Mitt Romney would be the next president. There are many American citizens living in Israel who will cast ballots, and get-out-the-vote activities are under way. One purportedly nonpartisan organization, iVoteIsrael, has come under fire for allegedly favoring Romney, a charge the group denies. Whomever they're voting for, there are indications that more Americans in Israel are voting this year than in past contests.